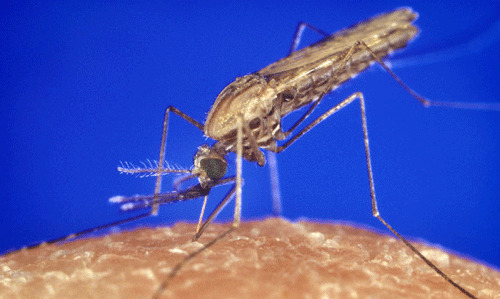 Anopheles gambiae Giles is the most efficient vector of human malaria in the Afrotropical Region (CDC 2010). Thus, it is commonly called the African malaria mosquito. The Anopheles gambiae complex of sibling species (White 1974; Fanello et al. 2002; Coetzee et al. 2013) comprises eight reproductively isolated species that are almost indistinguishable morphologically: Anopheles amharicus Hunt et al. 2013, Anopheles arabiensis Patton 1905, Anopheles bwambae White 1985, Anopheles gambiae Giles 1902, Anopheles coluzzii Coetzee & Wikerson 2013, Anopheles melas Theobald 1903, and Anopheles merus Dönitz 1902. Collectively they are sometimes called Anopheles gambiae sensu lato, meaning ‘in the wider sense.’ None of these species occur in North America. Figure 1. Female Anopheles gambiae Giles taking a blood meal. Photograph by Jim Gathany, CDC. Members of the Anopheles gambiae complex are found throughout tropical Africa (WHO 1989), south of the Sahara desert, with Anopheles arabiensis extending across southern Arabia. Anopheles gambiae s.s. is distributed throughout sub-Saharan Africa, including Madagascar (WHO 1989). Figure 2. The approximate distribution of Anopheles gambiae s.s. Giles in tropical Africa. Diagram by Sabrina White, University of Florida, based on maps and data from Sinka et al. 2010. Adults: Adult female Anopheles can be differentiated from other mosquito genera because the palps (appendages found near the mouth) are as long as their proboscis (feeding tube) (Foster and Walker 2009). Adult Anopheles also have a distinguishable resting position where their abdomen is raised into the air (Foster and Walker 2009). Anopheles gambiae have a variable body color, but it typically ranges from light brown to grey with pale spots of yellow, white or cream scales, and dark areas on their wings (Gillies and de Meillon 1968). In comparison to other species, adults are considered small to medium-sized mosquitoes with average wing length varying from 2.8 to 4.4 mm (Gillies and de Meillon 1968). Figure 3. Adult female African malaria mosquito, Anopheles gambiae Giles. Photograph by Lyle Buss, University of Florida. Figure 4. Female Anopheles gambiae Giles taking a blood meal. Photograph by James Gathany, CDC. Eggs: Eggs are between 0.47 and 0.48 mm long, convex below and concave above, and the surface is covered with a polygonal pattern (Gillies and de Meillon 1968). Similar to other Anopheles species, Anopheles gambiae lay their eggs singly and directly on the water, with each egg having floats on either side (Foster and Walker 2009). Anopheles eggs are not drought resistant (CDC 2010). Figure 5. 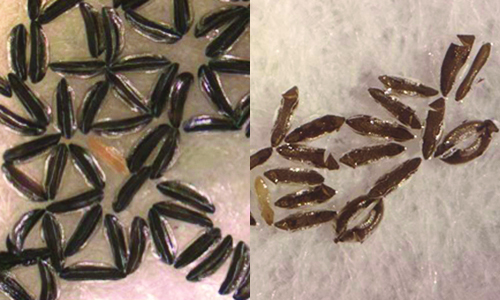 Unhatched (a) and hatched (b) eggs of Anopheles stephensi Liston, showing the characteristic singly laid Anopheles eggs with floats on both sides, and the split where the larva emerged. Photograph by Mark Benedict, CDC. Larvae: All Anopheles larvae lack the respiratory siphons used as breathing tubes in most other mosquito genera, and therefore the larvae lie parallel to the water surface in order to breathe (Foster and Walker 2009). Anopheles mosquitoes develop though four larval sizes or instars before pupating (Foster and Walker 2009). Larvae are very small in the first instar and increase in size until reaching 5 to 6 mm by the completion of the fourth instar (Gillies and de Meillon 1968). They feed on organic matter and algae (Garros et al. 2008). Figure 6. Larva of the African malaria mosquito, Anopheles gambiae Giles. Photograph by Ray Wilson, Bird and Wildlife Photography. Pupae: Pupae of all mosquitoes are comma-shaped when viewed from the side (CDC 2010). Unlike the pupae of many other insects, mosquito pupae are very mobile; they use the paddle at the end of their abdomen to quickly move through their aquatic habitat (Foster and Walker 2009). The pupal stage does not feed (Foster and Walker 2009). Figure 7. Pupa of the African malaria mosquito, Anopheles gambiae Giles. Photograph by Ray Wilson. As with all mosquitoes, Anopheles gambiae has four life stages: egg, larva, pupa, and adult. Both male and female adult mosquitoes feed on nectar from plants, but only the female bloodfeeds on vertebrates, where she obtains nutrients for her eggs (Foster and Walker 2009). Although adults can survive for up to one month in captivity, they usually survive around one to two weeks in the wild (CDC 2010). Anopheles gambiae adults are active at night, with peak hours of activity from after midnight to 4:00 am, with activity continuing until just before dawn (Gillies and de Meillon 1968). The females prefer to bloodfeed indoors, but outdoor feeding also occurs (Tuno et al. 2010). Anopheles gambiae are anthropophilic, meaning they prefer to bloodfeed on humans as opposed to other animals (White 1974). This makes them very efficient vectors of the human malaria parasites and contributes to their status as one of the most important malaria vectors in the world (CDC 2010). Adult females lay their eggs on the surface of water in a variety of aquatic habitats, but prefer shallow sunlit pools of standing water (Gillies and de Meillon 1968). Larvae hatch from eggs and develop within the aquatic habitat. Studies have shown that Anopheles gambiae larvae can develop in permanent man-made structures such as concrete tanks and drainage canals (Mala et al. 2011) and natural pools such as swamps, hoof prints (Kweka et al. 2012), and marshes (Mala et al. 2011). As for all mosquitoes, the larvae of Anopheles gambiae pupate after the fourth instar once they acquire an appropriate amount of nourishment (Foster and Walker 2009). The pupal stage is a non-feeding, mobile stage, during which the mosquito’s adult body is formed. Anopheles gambiae can develop from egg to adult in 10-11 days, but development is temperature dependent and can take as long as three weeks under colder conditions (Gillies and de Meillon 1968). Seasonal abundance of Anopheles gambiae varies depending on location, but generally the population decreases during the dry season and peaks during the wet season (Gillies and de Meillon 1968, Yaro et al. 2012). Populations begin to increase as the rainy season commences, peak in mid-season, and decline as water levels stabilize and aquatic predators establish themselves (Gillies and de Meillon 1968). Figure 8. An example of the sunlit pools that are ideal larval habitats for Anopheles gambiae Giles. Photograph by CDC. In Africa in 2010, there were an estimated 174 million cases of malaria and 596,000 deaths (WHO 2012). Approximately 90% of all malaria deaths occur in Africa (WHO 2012). Anopheles gambiae are considered to be one of the world’s most important human malaria vectors because of their susceptibility to the Plasmodium parasite, their preference for humans as a host and their indoor-feeding behavior (CDC 2010). Due to their short development time and their preference for developmental habitats near human dwellings, Anopheles gambiae are considered effective vectors of human malaria, as well as lymphatic filariasis (elephantiasis). It is important to note that the mosquitoes themselves do not cause the malaria disease. Malaria is caused by a protozoan parasite in the Plasmodium genus that the mosquitoes transmit through blood feeding (Foster and Walker 2009). Different species of Plasmodium infect different vertebrate groups, including humans, other mammals, birds and reptiles. Not only is each Plasmodium specific for the vertebrate, many are transmitted to the non-human vertebrate by different mosquito species; for example, mosquitoes in the Culex genera are important vectors for transmission of Plasmodium among birds (Foster and Walker 2009). Human malaria is caused by four human-specific species of Plasmodium: Plasmodium falciparum, Plasmodium malariae, Plasmodium ovale and Plasmodium vivax (WHO 2013), plus one zoonotic species, Plasmodium knowlesi, known from monkeys in southeastern Asia. The parasites are transmitted in the saliva of female Anopheles mosquitoes (Foster and Walker 2009). When a female Anopheles mosquito takes a blood meal from an infected human, she ingests the Plasmodium parasite and, after a certain developmental time within the mosquito, she can transmit the parasite through subsequent blood feedings (Foster and Walker 2009). The human malaria disease is characterized by sudden fever and chills at regular intervals. Other symptoms can include fatigue, headache, and sweating after each fever (Foster and Walker 2009). Malaria is no longer transmitted regularly in the United States; however, historically it was an important disease. More information can be found on historical malaria transmission in the U.S. in the Anopheles quadrimaculatus Featured Creatures article. Figure 9. Three pink crescent shaped Plasmodium falciparum gametocytes, which are the cells that divide to form reproductive cells. Photograph by Dr. Mae Melvin, CDC. Figure 10. Swelling of the abdomen, eyes, feet and hands are a common symptom of kidney damage associated with infection by one type of malaria, Plasmodium falciparum. Photograph by Dr. Myron Schultz, CDC. Various management techniques are used to control mosquito populations and limit malaria transmission in an area. Effective and currently used management practices include education of the community about malaria and the role of mosquitoes in transmission, house and environment modifications to prevent mosquito entry and to reduce larval development site availability, and the use of bed nets, spatial repellents, and indoor residual spraying (IRS) of insecticides (Takken and Knols 2009). Proposed management practices include the introduction of biological controls such as predators, sterile insect technique (SIT), and the release of genetically-modified mosquitoes (Takken and Knols 2009). Greatly assisted by multiple organizations such as The President’s Malaria Initiative and The Bill and Melinda Gates Foundation, the distribution of insecticide-treated bed nets in Africa has profoundly decreased the incidence of malaria (CDC 2012). About 145 million treated bed nets were delivered to sub-Saharan Africa in 2010 alone (CDC 2012). Heavy reliance on insecticides in an area can lead to the development of insecticide resistant mosquito populations (Brogdon and McAllister 1998, Mawejje et al. 2013). Studies in eastern Uganda have found that Anopheles gambiae are extremely resistant to pyrethroid insecticides. Such high resistance levels could decrease the efficacy of pyrethroid treated bed nets (Mawejje et al. 2013). For this reason, studies monitoring resistance to insecticides in mosquito populations should be conducted regularly. Modifications of the home and environment also can lead to dramatic changes in mosquito abundance (Takken and Knols 2009). Screens placed over doors and windows can prevent mosquito entrance, reducing malaria cases in an area (Takken and Knols 2009). Making small environmental changes to decrease the number of breeding sites also can lead to substantial decreases in mosquito populations (Takken and Knols 2009). The periodic draining of rice fields and fish ponds was a very effective method used in Java, Indonesia (Takken and Knols 2009). Figure 11. Digging drainage canals to remove standing water is one method to reduce mosquito larval developmental opportunities. Photograph by CDC. Brogdon WG, McAllister JC. 1998. Insecticide resistance and vector control. Emerging Infectious Diseases 4: 605-613. CDC. (2012). Insecticide-treated bed nets. Malaria. (04 September 2014). CDC. (2010). Anopheles mosquitoes. Malaria. (04 September 2014). Coetzee M, Hunt RH, Wilkerson R, della Torre A, Coulibaly MB, Besansky NJ. 2013. Anopheles coluzzii and Anopheles amharicus, new members of the Anopheles gambiae complex. Zootaxa 3619: 246-274. Davidson G, Paterson HE, Coluzzi ML, Mason GE, Micks DW. 1967. The Anopheles gambiae complex, In Wright JW & Pal R (Eds.) Genetics of insect vectors of disease. Amsterdam, Elsevier. Fanello C, Santolamazza F, della Torre A. 2002. Simultaneous identification of species and molecular forms of the Anopheles gambiae complex by PCR-RFLP. Medical and Veterinary Entomology 16: 461-464. Foster WA, Walker ED. 2009. Mosquitoes (Culicidae). In Mullen, G, Durden, L. (Eds.) Medical and veterinary entomology. 2nd Ed. (pp. 207-259). Academic Press, Burlington, MA. 637 pp. Garros C, Ngungi N, Githeko AE, Tuno N, Yan G. 2008. Gut content identification of larvae of the Anopheles gambiae complex in western Kenya using a barcoding approach. Molecular Ecology Resources 8: 512-518. Gillies MT, de Meillon B. 1968. The Anophelinae of Africa south of the Sahara (Ethiopian Zoogeographical Region). Publications of the South African Institute for Medical Research 54: 1-343. ITIS. (2013). Anopheles gambiae Giles, 1902. Integrated Taxonomic Information System, United States Geological Survey, Reston, VA. (04 September 2014). Kweka EJ, Zhou G, Munga S, Lee MC, Atieli HE, Nyindo M, Githeko AK, Yan G. 2012. Anopheline larval habitats seasonality and species distribution: a prerequisite for effective targeted larval habitats control programmes. PloS One 7: 1-10. Mala AO, Irungu LW, Shililu JI, Muturi EJ, Mbogo CC, Njagi JK, Githure JI. 2011. Dry season ecology of Anopheles gambiae complex mosquitoes at larval habitats in two traditionally semi-arid villages in Baringo, Kenya. Parasites & Vectors 4(25) doi:10.1186/1756-3305-4-25. Mattingly PF. 1977. Names for the Anopheles gambiae complex. Mosquito Systematics 9: 323-328. Mawejje HD, Wilding CS, Rippon EJ, Hughes A, Weetman D, Donnelly MJ. 2013. Insecticide resistance monitoring of field-collected Anopheles gambiae s.l. populations from Jinja, eastern Uganda, identifies high levels of pyrethroid resistance. Medical and Veterinary Entomology 27: 276-283. Sinka ME, Bangs MJ, Manguin S, Coetzee M, Mbogo CM, Hemingway J, Patil AP, Temperley WH, Gething PW, Kabaria CW, Okara RM, Van Boeckel T, Godfray HCJ, Harbach RE, Hay SI. 2010. The dominant Anopheles vectors of human malaria in Africa, Europe and the Middle East: Occurrence data, distribution maps and bionomic précis. Parasites & Vectors 3:117 doi: 10.1186/1756-3305-3-117. Takken W, Knols BGJ. 2009. Malaria vector control: Current and future strategies. Trends in Parasitology 25: 101-104. Tuno N, Kjaerandsen J, Badu K, Kruppa T. 2010. Blood-feeding behavior of Anopheles gambiae and Anopheles melas in Ghana, western Africa. Journal of Medical Entomology 47: 28-31. White GB. 1974. Anopheles gambiae complex and disease transmission in Africa. Transactions of the Royal Society of Tropical Medicine and Hygiene 68: 278-298. White GB 1975. Notes on a catalogue of Culicidae of the Ethiopian Region. Mosquito Systematics 7: 303-344. World Health Organization (WHO). 1989. Geographical distribution of arthropod-borne diseases and their principal vectors. Geneva: World Health Organization, WHO/VBC/89.967: 7-22. World Health Organization (WHO). 2012. World malaria report 2012. WHO Press, Geneva, Switzerland. World Health Organization (WHO). (2013). Malaria. (04 September 2014). Yaro AS, Traore AI, Huestis DL, Adamou A, Timbine S, Kassogue Y, Diallo M, Dao A, Traore SF, Lehmann T. 2012. Dry season reproductive depression of Anopheles gambiae in the Sahel. Journal of Insect Physiology 58: 1050-1059.